Extends previous patch by blanking out sidebar and mail as well. Screenshot of XWT showing untrusted "scar" in lower left. control for the location bar is changed and the original one is made hidden. This has more to do with layout, I think. Reassigning to layout module. release, and we should have PR3 out soon thereafter? one lower on the priority list for security bugs. Should we make it post-Beta2? need info: mstoltz: do we really need to fix this for nsbeta3? security exploit and (until just now) visible to the public. committing to fix P1-P3, but not P4/P5. this can be done without any XUL support, in any browser. anytime soon and it probably affects other major browsers. lock icon, unspoofable. Can the Phoenix folks be thinking about this too? same can be accomplished with purely HTML. Btw, I think IE has the same problem. content and should therefore not be trusted" in a short and understandable way. The only solution I see is to not allow windows to have their chrome hidden. they're actually using Mozilla for their experiments. I'm going to try to get the Dartmouth author onto this bug. easier for people like her to contact us. the first few letters of a window title to be something special ("Web App"?). text? jag's right, it's hard to convey the problem to users. CCing Eileen, the author of the Dartmouth reports. Page Popup Window". This would be a handy place to put popup blacklisting too. through some color and texture variations. password prompt or some other dialog, it won't have the right cycling chrome. Everyone should read the Usenix paper BTW. the URL bar but rather to a sevice such an anonymizer.com. about UI that spoofs the user so these are not relevant to the original report. threat than the UI spoof that it morphed into. your original report is significant, then please open a new report on it. lines suggested in comment 25.
putting it around the content? have a color bar placed in the system tray. a useful feature to have, and could co-exist along with the Dartmouth solution. Some changes didn't seem to take. Applying. do the trick. None of these make the browser more appealing to use though. content area of another window. Attaching a patch that implements the idea in the last paragraph of comment 27.
user can determine what is trusted and what is not. through tabs and other hidden states. to figure out what content is trustworthy. want those two covered (inspector would be a nice bonus). Attaching a demo of spoofed UI so that the patch presented here can be tested. > least want those two covered (inspector would be a nice bonus). It does cover sidebar. Try it out and you'll see that it works. I'll look into mailnews next. The chrome is not collapsed but the content area is. Could you be more explicit regarding your first, second, and fourth paragraphs. I'm not exactly sure I know what you are saying there. >> least want those two covered (inspector would be a nice bonus). > It does cover sidebar. Try it out and you'll see that it works. contents are untrusted and should be collapsed along with the content window. I'll look into that as well. Thanks. I'm cc'ing roc, who suggested that we open this bug up. as we have done for JS alerts, etc., for ages? open up all the real chrome but then put up a spoofed sidebar? Is the title bar solution cross platform? chrome will still capture it. spoofed chrome can unblank the content area that the chrome code has blanked. buttons as the triggering event. This was done for testing purposes only. the one we don't want. Attaching a cleaned-up version of original patch so that it can be reviewed. I'll take over ownership of this. jag is already on the cc: list for xpfe. >before you tell the user that it's not real chrome? could be flagged in the titlebar. So? It can do this with DHTML. What problem are you solving? >Or it could open up all the real chrome but then put up a spoofed sidebar? >Is the title bar solution cross platform? may have more work to do. no better, due to the opportunity costs. and better alert them via a titlebar change? I must agree with brendan here. (some ways to advertise this would be hint pages at startup, help pages etc. although I can't think of a really good one). and checked in and think of new and better ways that can help us. title bar could even mention the keypress. is that it decreases the beauty that was designed into the screen display. Bug 182078 has been filed for that. doesn't adequately solve the UI spoofing problem. I will veto any solution that is based off a non-discoverable key binding. Please consider some of the other suggested approaches. integer 0, which makes that slice always return the empty string. more automatic spoofing defenses, if we need any. * Can you change the magic 66 to 'b' or something more descriptive? changed so that we only load it when the key combo is pressed. more descriptive and should someday become a DOM Rec. * Can content generate this key event and fool you into blanking (DoS attack)? then. jst at least will know how to check this. chrome or not. Is there any other way to achieve what you want? of being accepted. The patch here solves part of the problem. It can fix it now. provide a little bit of protection against all of them at once. anyone wants to be added to the Cc of that bug please let me know privately). (for example all the same origin checks). fixing the problems small piece at a time. I am hoping that those that are against this would still reconsider. image that looks like a popup window with any desired title. approximately zero. I don't think saying "we'll add discoverability later"
implement the former is highly questionable. Just wanted to mention one spoofing scenario that I have not seen mentioned. made nearly indistinguishable from a real window. It could even be moved around. but most users don't try to move dialogs before typing in them. Protecting the titlebar or any other window chrome can't prevent this. AOL user. UI spoofing is quite common on AOL - and it works. Mitch: re: comment #61 -- roc raised that point in comment #59 paragraph 1. Why add those commented-out document.getElementById calls? verifies. "to verify chrome"? Hrm. > verifies. "to verify chrome"? Hrm. with the desired wording. Adding "chrome" after "verify" is certainly a good idea. Let me continue explaining the attack of this spoofed window inside a window. that inner window image is real. tells the user that something is not kosher. the outer window but I have it overlapping the chrome area of the outer window. That's my error, so please excuse that oversight. as other windows on his PC, he STILL thought it was a native windows dialog box. see when they realize something is fishy to draw any real numbers. with ready implementations, for bad guys). Dude, the "bad guys" aren't stupid, they've already had all these ideas. stock of the Web browser implementer community, there is little more we can do. what I mean. Yes, that inset is there, but it's hardly noticable. untrusted content being able to spoof UI to a novice user? This should IMHO be WONFIXed and made public. See comment 75 and comment 79.
thought of, and used, everything discussed in this bug. happening. Just because a 100% solution is impossible is no reason not to seek 80%. wild, and there's published research on chrome spoofing. definitely glad I customize my browser. a browser". As such, I believe it's useful. suggestion uses the second solution in a way that should be acceptable to all. discoverability to resolve the change in handling. attention. The same thing could be done with the 'hide bars' button. convenient interface to do so. and that there is an easily discoverable way to make the window have no chrome. protect against the DHTML spoof, it certainly would cover pop up windows. separate bug from XUL chrome spoofing. button to white-list that site/domain, so that the bar won't show up. page using XUL, it would be BELOW the UI. bar and allow the user to turn it off for that website/domain. Agreed, the yellow box may be a more in the lines of current responses. with DHTML, and therefor without warning. believing the “yellow  information bar” is too apocalyptic and start ignoring it. be significantly easier, while achieving the same results as what I proposed. we are breaking their apps, but frankly I think "tough". "Warning". you cannot remove it. obviously there must be some reluctance to that or it'd be done already. 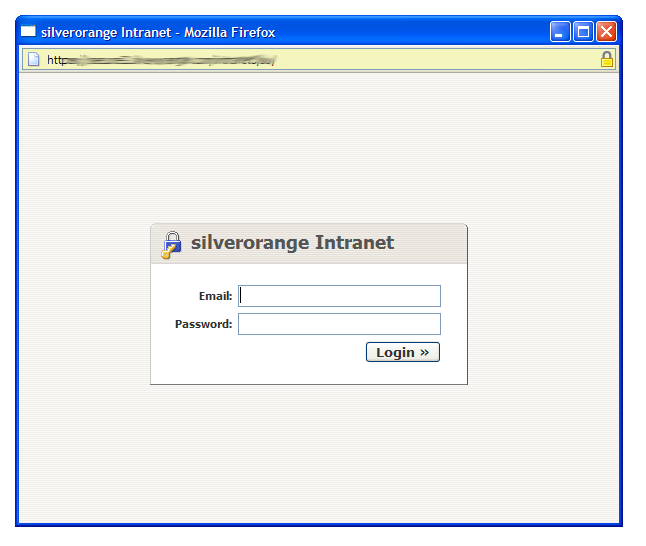 screen shot of a typical popup with the patch implemented (suite). Might as well take the bug, Mitch isn't around. especially if you're turned off extra buttons as I have). I think it's important for this UI to be consistent with the normal UI. lock -- easier to train people to look in one place rather than two. pages: I fear people won't learn to look for it since it's a sometimes thing. hiding the menus and trapping Ctrl+J). > pages: I fear people won't learn to look for it since it's a sometimes thing. > hiding the menus and trapping Ctrl+J). mitigate this problem by disabling hiding of the statusbar by default. I think disabling location=no is a fine idea. > The lock isn't important for spoofing like this. someone is Ben, at least for Firefox. unlocked lock for non-secure pages. > I think it's important for this UI to be consistent with the normal UI. standard address bar and would therefore be more vulnerable to phishing scams. However, a read-only address bar could be stripped of the user:pass part. look like a domain name. show extremely long URLs, only the first chunk of it? Okay, Firefox displays the target hostname next to the lock in the status bar. Seamonkey work the same way. > Okay, Firefox displays the target hostname next to the lock in the status bar. > So bug 252811 really takes care of this issue for Firefox. outer height of the window, or the client height area? one more tabstop, messing up the tab sequence. etc from chrome: with options such as always/never for this site/session, etc. ones which pop up in ie's fancier features every day. Robert said: "Maybe the hostname should be displayed for all sites." Ben said: "I actually prefer forcing the location bar than forcing the status bar,"
shaver, roc, dbaron, asa, myself). buttons when the opening page is attempting to hide the toolbars. > Robert said: "Maybe the hostname should be displayed for all sites." whereas DNS or HTTP hijacking requires some sort of active packet injection attack. I think we can work around the sizing issues. at the location bar first because it's at the top of the page. >   unless the SB is compulsory. user:password thing) in a regular browser window. > (e.g., a spoofed location bar). Perhaps. How about normal font for non-secure sites, and bold for secure sites? something, or it was 99.9% right but said something more often? > bar to get any meaningful security info. > (except for the click-on-lock behaviour). for aesthetic reasons on certain types of window - web app URLs are ugly these days. less ugly ;-) and taking up less space. IIRC) and depending on theme chosen. Brendan and I, and dveditz and I on separate occasions talked about this. able to get to that in one pass, but I think that should be the goal. The sizing isn't dramatically different from the status bar. Would you do this for all popups or just the ones that use Downlaodable XUL? an XUL "program" is going to run? minimul interuption (like for flash popups on marchofdimes.com and the like). I haven't exhaustively tested this, but am interested in feedback. really see a need for the status bar on non-secure pop-ups however. read-only location bar from this patch. size is added on to whatever the site requested. patches. There's no point in having both - it would just confuse users. location bar should only display the domain of the site. See comment 126). domain bold or a different colour). tomorrow. come with recommendations and lets get this wrapped up. > domain bold or a different colour). which is about long usernames. The most common form of color blindness involves confusing red with green. causes everything to be gray. only one "alert" color with all else being black. would get the point across (obviously not required for popups with chrome). it's way too easy to push something offscreen if it's appended. > it's way too easy to push something offscreen if it's appended. offscreen, even partially offscreen. Am I mistaken? the side of the window can be on top of any given side of a browser window. Attachment #155874 - Flags: approval1.7.x? Attachment #155874 - Flags: approval-aviary? because of a js error. spoofing) which is controllable via a hidden pref. These could go in all.js, Seamonkey wants these too. approach is to be taken there. removeAttribute for the "context" property too. windows. There should always be only the location bar. fullscreen which is independent from user customization. that might interfere with url selection (which I'd like to have). Interaction with the throbber and the site icon seems kindof weird to me. problem when every dump user now sees the complete URL in the top of the window. Popup windows are often used as logins etc. Also, why do we need the google textbox in a popup??? platform is going to be neglected. > Popup windows are often used as logins etc. That's a good reason to prevent pop-ups from being spoofed. > Also, why do we need the google textbox in a popup??? > as a web platform is going to be neglected. this to be disabled by preferences on a per-site basis. the rest of the browser too - see Bug 247603.
elements other than the URL bar. will be visible under the special location bar in popup window without toolbar. I'm afraid I'm alone with my concerns regarding this approach here. popup block wouldn't have a chance to prevent this (Look at netscape.com). with the chrome flag in windows.open and now continues with these toolbars. I doubt that after all I get heard but thanks for reading this. > popup block wouldn't have a chance to prevent this (Look at netscape.com). simply inspecting the UA string! security "enhancements" hinders web-app developers from doing their job. clients the look and feel. Another alternative is to recommend Seamonkey 1.5.
window" contained in the content area too small and try to make it larger. Some, like me, always maximize browser windows. > window" contained in the content area too small and try to make it larger. > Some, like me, always maximize browser windows. Some like you recognize spoofing by other methods already. talking about trying to catch <1% of users who surf to a specific page. our clients to disable it. If encryption is outlawed then only outlaws will have encryption. secure site - putting an icon on the title bar. window - they could still do it in JS). this bar, the changes will be apparent when you will reload the main window. Toolbar separators should be removed also. remove all toolbars except the location bar. 2) If the throbber is present on the navigation toolbar, it doesn't get hidden. middle-clicked, opening up the Firefox product page. track whether a link *should have* changed domains (agree/diagree)? images, form actions... place an address bar over all those too? Shimmer. matured function like window.open's default behavior). to compromise on these to and force-display them? would really like to see Advanced > Browsing > [X] Hide URL Bar in Popup Windows). place. That's why I'm saying to just use an information bar on web apps. Summary to self for future doco: user optical problem, forced statusbar solution. Sorry for the spam but 186 comments I'd otherwise have to read 3-5 times! Can I hide the toolbar when using signed scripts? instead of the location bar again. Get 1.0PR (out now) to test it. > instead of the location bar again. if they don't trust it. this bugs solution (dispalying the domain). data transfer... nor content spoofing, without an certificate alert. even the native window-dressing can be changed via XUL(?).. Possibly related to Mozilla bug#257036. rendering of XUL would mean there's a buffer overrun in Gecko somewhere (*). > window-dressing can be changed via XUL(?).. from the OS X method. In a word: no. That would never be possible. browser. Or the URL they're currently on. obtrusive but would get the point across. Sorry for the bugspam >_<. > great detail if they don't trust it. Is there some way of denying fake chrome the right to change the mouse icon? site in the above section is secure, then load the chrome or spoofed html in there. techniques, without severly limiting the flexibility of the browser. instead of just copying what MS has done in IE? server (and points to the correct domain according to the location bar). well to fool users on both Mozilla and IE, status bar or no). have no chrome and be spoofed even easier than anything in Mozilla. that still merit discusion and that haven't been addressed in this thread. > instead of just copying what MS has done in IE? expanding its 'Extenally Loaded Documents' tree? in a web-application, there's no value IMO to forcing the status bar to be on. I'd be happy with this compromise. users won't know what the special cursor means anyway. inadequate, I think), we could do what I described in bug 244965 comment 46. That should also satisfy the Corporate Customers (does it?). users into thinking it's real window. colours to a custom scheme, and then the address bar will really stick out. bar will stick out even more. As I said, I don't want to turn my customers away from Firefox. > hide the location bar". 0.1, and yes I see the location bar is no longer being forced. Phew! Thanks for setting me straight ..
> current behaviour (it forces the location bar). Firefox 0.9 and 1.0PR were built from that branch, and 1.0 will be. removing stale review request. please re-request review if i'm mistaken. Removing review request from obsolete patch. and it seems like it would help somewhat with phishing sites. Microsoft are on to a winner there. which slows them down, or check neither, because they can't be bothered any more. Maybe override "rightclick disabled" if all chrome is removed ? chrome", except it would need a more user-friendly name. This would enhance security, and usability. issues for 1.0.1, who is owning them? Dan, is this you? suggest somehting like "<my title> - domain" in the window. - Will something prevent me from positioning/resizing my window.open() window? cautious when implementing these "features". Keep in mind: FF is not only a browser, it's still a platform for remote apps. If this isn't wanted anymore, please let us all know, so we can save a lot of time. This patch adds the host name to locationbar-less windows. keeps the scheme and host from disappearing. > This patch adds the host name to locationbar-less windows. bar, which is always-on and gives a lot of information about the site concerned. What advantage is there in adding it to the window title also? Are we guaranteed that the ordering of SetTitle and the "window DOM element"
Are we guaranteed that this is the only way that there will be no location bar? Note that these are both null-safe, so need to even null-check dsitem here. Why are we not using CreateExposableURI here? We really should be, imo. needs to be somehow involved in this too, instead of changing the binding? semi functional fake toolbars displaying the spoofed site's URL. not convinced this is a much stronger argument. information in the left hand part of the status bar. shipping with FFM/Moz), medium, and advanced user. that exists now, but instead not be checkbox remember-able. behavior of webapps.. and new internet USERS WILL STILL BE OBLIVIOUS to those. displaying the URL/host in some bar just _wont_ do that. that they now understand all this stuff, again unlike some passive display. this?" prior to display EVERY page. simply hurts the wrong people, namely web app developers. A zone modell or Ken's idea would help here. newbie perspective) to look for warning signs or phishing.. Definately get ignored. discepancies, like what this bug was intended for. all? That would prevent most phishing attacks. a user could set, but I don't think I'd have it set by default. if you really want to protect non SSL domains, which I don't see the advantage of). something like that), then just a button in the statusbar). Finally, I see no drawback to implementing these two solutions. > Finally, I see no drawback to implementing these two solutions. users" aren't going to know the difference in any case. proactive options, rather than focusing on reactive ones. customers about the dangers of spoofing/phishing. > notification) that pops up near the system tray (Windows specific). VERY large dialogs, such as whole lists of x509 subject-alt names. > > Finally, I see no drawback to implementing these two solutions. I should have made myself clear -- I meant 'drawbacks' which break the browser. which carry information they should be paying attention to. make sure the title reads correctly. the state of the location bar. Made xpfe's updateTitleBar match the one in toolkit. Attachment #174420 - Flags: approval1.8b? Attachment #174420 - Flags: approval1.7.6? Attachment #174420 - Flags: approval-aviary1.0.1? general, btw. If you haven't, please do. at a particular site, and press Ctrl-T.
about working out a co-ordinated approach to this entire class of problems? currently is, so I can live with it. against them, but these are two different things). when the designing is best left to the designers. a=chofmann for branches over the phone. tested with 2005021806-1.0.1 firefox builds on Windows XP and Mac OS 10.3.8.
window with an XML parsing error. (the one below is from the URL). Line Number 231, Column 35:    <key id="key_viewInfo"
is this now expected behavior, ie, does this result mean this bug is fixed? locally), I temporarily set the pref security.checkloaduri to false. behind the one in step (1) --bring that to the front. said he's looking into fixing that aspect. 5. when the results appear, ctrl-click (cmd-click on Mac) some of the links. results: because there is no Location or toolbar, the tabs will *not* appear. however, you can cycle through them using ctrl-tab. displays (b) and (c), and where applicable (d). tested with 200502170x-1.0.1 firefox builds on Mac 10.3.8, WinXP and Linux fc2. > tested with 2005021806-1.0.1 firefox builds on Windows XP and Mac OS 10.3.8. > window with an XML parsing error. (the one below is from the URL). > Line Number 231, Column 35:    <key id="key_viewInfo"
> is this now expected behavior, ie, does this result mean this bug is fixed? that page for any current testing. That being said, would it be useful to this bug if I made a version for FFX 1.0? Will this be going into the trunk? Please re-read the bug. It stopped being about "XUL" around comment 18 or so. > Will this be going into the trunk? the status bar) rather than two (if it's SSL..., if it's not...). If this can block 1.0.1, it should certainly go in for 1.1. Marking with a ? > > tested with 2005021806-1.0.1 firefox builds on Windows XP and Mac OS 10.3.8. > > window with an XML parsing error. (the one below is from the URL). > > Line Number 231, Column 35:    <key id="key_viewInfo"
> > is this now expected behavior, ie, does this result mean this bug is fixed? > that page for any current testing. > That being said, would it be useful to this bug if I made a version for FFX 1.0? I guess most would really appreciate, that the problem still exists. As long as it doesn't take many hours to modify the proof-of-concept. > I guess most would really appreciate, that the problem still exists. > As long as it doesn't take many hours to modify the proof-of-concept. Quick-and-dirty. New version of test case. Works (for me) on FFx 1.0.x. I would argue that the status bar isn't enough. > > I guess most would really appreciate, that the problem still exists. > > As long as it doesn't take many hours to modify the proof-of-concept. > Quick-and-dirty. New version of test case. Works (for me) on FFx 1.0.x. > I would argue that the status bar isn't enough. RED, that someone tempered with crome? Right beside the keylock. out in comment 190 (bug 259159). a second tab in which case the tabbrowser code takes over). but with the true status bar being blank it's easy to miss. infobar's ability to go away for specific sites. possibly leaving a tiny grippy to reopen it? flexability of the development tools, be hindered as little as possible. this idea to the operators of such sites. technical means. This is a cultural problem. > a shoot-down reasoning. my 2 pesos. concentrated. This was the first indication that one existed. Append to subject? that which I mention in the paper I just sent you. offer the false sense of security that an unchecked domain name gives. BTW, Jeff: this spoof is a great piece of work. Nice one, my son. how can i stop receiving bugspam from this bug? can't find a way in bugzilla to remove the reporter from this bug? > customers about the dangers of spoofing/phishing. appear where a Mac users expects it, as with Windows, Linux, etc. advisories (cookies etc), i.e. its extensible. have x unread meassages' type functionallity. position and size during scroll. I don't agree that a solution along the lines of comment #272 would help. than when I visit a new site. > I don't agree that a solution along the lines of comment #272 would help. layman user*. In fact I only look at to see what URL a link will take me too. I'm sure this represents 90% of the everage joe if you poll their use behavior. give another click to tha screen. that you dont want the more 'proactive' warnings, fine for your tastes, yes. I'll keep the advisories turned on. when a link is clicked containing user:pass@host... just a few examples. bar to compete with that will be a tall order. > annoying to get the users attention. whatever equivelant in non-Windows OSs) with a coresponding icon (like a lock). if it’s missing, bells go off. more information about the feature itself (a “what is this” button or link). are the same (though I guess that wouldn’t be hard to spoof). forums, etc.? Should this conversation be moved to a new feature request? > > annoying to get the users attention. the status bar isn't doing right now, and I cant see it doing. a new Buzilla entry should be created as an RFE, by you. cross site zcripting and injectable code on 3rd part sites... a sublist to be sure). i disable new mail notifications. if i don't, i'd have it splashing every minute. Hostname in titlebar for Firefox 1.5 -> bug 304388. Clearing bit-rotted review request - this seems to have migrated to bug 258405 anyway. In which case should this one be WONTFIXed?